HARTFORD - Katie Lou Samuelson’s favorite quarterback from her alma mater, Mater Dei High, is Matt Barkley. In 2013, Barkley became the school’s third signal-caller taken in the NFL draft in eight years. Samuelson’s right arm is used mostly for shooting on the UConn women’s basketball team. But her bomb that led to a layup for Napheesa Collier late in the first half of the second-ranked Huskies’ 99-63 rout of No. 16 DePaul at the XL Center Wednesday was as good a toss as Barkley, or Colt Brennan, or Matt Leinart could have made. The little shimmy from the senior All-American that came with the assist was even better. 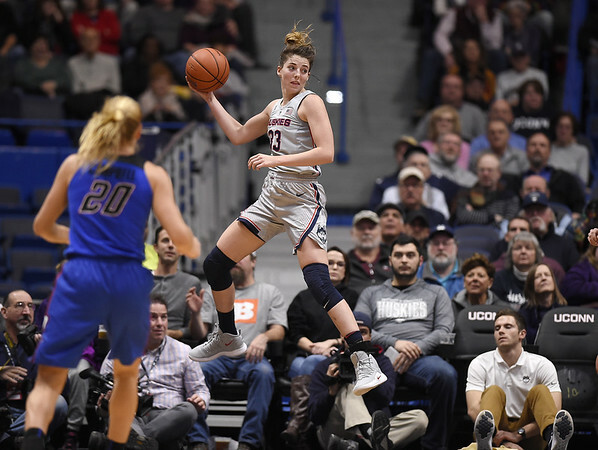 Her 3-pointers - she tied Maya Moore for third on UConn’s all-time list with 311 and passed South Florida’s Kitija Laksa for the top spot among American Athletic Conference players - are seldom celebrated so demonstrably. “I don’t know, that just kind of happened,” Samuelson said with a laugh. “We had talked about that in practice that if they match us with that four across we’d try to throw it. Collier finished with a double-double of 24 points and 10 rebounds to go with seven assists. Samuelson chipped in 23 points with a 5-for-6 effort from behind the arc, eight rebounds, and four assists. The assist to Collier moved her into the top 25 on UConn’s all-time list in that category. The Huntington Beach, California, native has 341 helpers as she passed Amy Duran. “I thought I was going to miss it. I was going a little too fast,” Collier said with a smile. “I’m glad I made it. If I missed, Lou would have been mad. The Huskies’ senior class has had a lot of fun through six games as UConn (6-0) heads into Sunday’s showdown with No. 1 Notre Dame in South Bend. While many look ahead to the future this time of year with recruits signing their letters of intent, others still very much appreciate what they have now. The Huskies will leave for South Bend on Saturday for a two-game trip that will include Collier’s homecoming against Saint Louis University Tuesday. Notre Dame won the last meeting 91-89 in overtime in the national semifinals in Columbus, Ohio, on Arike Ogunbowale’s jumper with one second left en route to the Irish’s second national championship. “I don’t know if we can say we’re the underdogs, but it’s one of the first times we have the opportunity to prove ourselves and show what we can do,” Samuelson said. An opportunity the seniors don’t want to let pass by. Posted in The Bristol Press, UConn on Thursday, 29 November 2018 20:52. Updated: Thursday, 29 November 2018 20:55.